Khashgar, also called Khashi, was once a major halt for caravans on the Silk Road .It is now a prosperous commercial centre with a population composed of Uighur, Tajik and Kirgiz nationalities. Here it is the Han Chinese who are in the minority. This extraordinary overland trip travels from Tibet to Xinjiang province. Fell the great Tibet culture as you visit Holy Mount Kailash a key pilgrimage site, Jangtang plain and sandstone canyon. Changing terrain as you get closer to Xinjiang. Day 01: Arrive At Lhasa Airport/Train Station. Day 06: Drive Shigatse To Lhatse (150 Km) Via Visiting Shakya Monastery. Day 07: Drive Lhatse To Saga (293 Km). Day 08: SAGA-PARYANG (4,700m) 255km, 7hrs. Day 12: Dzutrul Phuk To Tirthapuri. Day 13: Drive Tirthapuri To Tsaparang. Day 14: Visit Guge Kingdom. Day 16: Drive Gar to Doma (230 Km). Day 17: Drive Doma To Tibet-Xinjiang (230 Km) Border At A Pass Marked With A Plaque In 4 Hours. Day 18: Drive Dahongliutan To Mazar (253 Km). Day 19: Drive Mazar To Yecheng (240 Km). Day 20: Drive Yecheng To Kashgar (236 Km). After Breakfast visit Potala Palace, the seat of both religion and politics in Tibet. The palace was built in the 7th century by Tibetan King Songtsen Gampo and later renovated by the 5th Dalai Lama in the 17th century. Afternoon visit Sera monastery (5km north of Lhasa), It was built in 1419 by Jamchen Choejie, a disciple of Tsongkapa, the founder of the Gelugpa sect. Sera is one of the three major monasteries of yellow sect in Tibet. After Breakfast visit Drepung monastery, which is the largest monastery of the Gelugpa sect in Lhasa, it was built in 1416 by Jamyang Choejie, a disciple of Tsongkhapa. After visiting Drepung, drive to Norbulingkha, the summer palace of Dalai Lama, which was built in the 18th century. Afternoon visit Jokhangn Temple and Barkhor market. Jokhang is the holiest shrine in Tibet and houses of golden statues of the Shakyamuni Buddha that was brought to Tibet by Chinese princes Wenchen. After breakfast drive from Lhasa to Gyantse (5-hour). Crossing over the summit of Kamba La Pass (4,794m), you’ll see the tranquil turquoise waters of Lake Yamdrok below. Far in the distance you’ll spot the towering, massive, Mt. Nojin Kangtsang (7,191m), and the stunning Karo-la Glacier (5045m). After arrival in Gyantse, you will tour Pelkor Monastery to admire fancy frescoes, statues and sculptures. Stay overnight in Gyantse. After Breakfast you will drive along the Friendship Highway amidst picturesque landscape driving past small town of Lhatse and Gyamtso La pass at 5,220m. As the route opens into plains, many monasteries and camps of nomadic herders become visible while on the way to Lhatse. Another day’s driving will take you to Paryang (15,700 feet or 4,750m) in the heart of western Tibet, where the four great rivers of South Asia diverge from their glacial sources around Mount Kailash. En route you will pass through the village of Dongba..
After Breakfast start driving again on rugged roads to Darchen (15,150 feet or 4,620 m) enjoy the views of Mount Kalaish, lake of manasarovar and an uninterrupted views of the Himalayas bordering Nepal en route. The windblown settlement of Darchen is the Pilgrim’s gate way to Mount Kailash. Here you will prepare for next day’s trekking. The pilgrim’s kora around Mount Kailash starts and finishes in Darchen, on the first you will trek 6 hours from Darchen to Dhira Phuk (16,450 feet or 5,010m) and camp at the Gompa near the back side of holy Mount Kalaish where you can see beautiful view of Kailash..
Today you will trek 6-7hours from Dhira Phuk to Dzutrul Phuk (15,700 feet or 4,790m). You will leave the Lhachu valley and enter the Dorma Chu valley, heading up towards a high pass above Gaurikund lake or Tuje Dzingbu (the bathing pool of Compassion) which is one of the highest lake in the world. Hindu pilgrim’s are supposed to take a ritual bath here. O/n camping at the Dzutrul Phuk. After the Circumambulating of Kailash. The best choice is camp at Tirthapuri, which is used to be a meditation cave for Padmasambayva and his consort Yeshe Tsogyel..T he final end of the Parikrama is an easy 2-3 hrs walk down to where the river emerges on to the Barga plain. We complete the 3 day circuit trek of Mt. Kailash and drive to Tirthapuri where there is a hot spring. Pilgrimage to Mt. 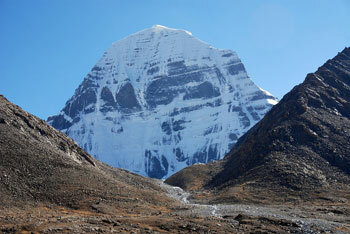 Kailash is not complete without visiting Tirthapuri for the Tibetan Buddhists. The Northwest from Tirthapuri, in the middle of the canyon erosion landscape of the Sutlej River, lie the impressive ruins of Toling and Tsaparang - flourishing centers of the former Kingdom Guge. Tsaparang disappeared in the middle of 17. Century; the Toling monastery, our today's goal was until the 1960's religious center. Fortunately, despite of devastations by the Culture Revolution some buildings and temple remained. Early in the morning we drive to Tsaparang (10 km, 3.800 m), the oldest center of Guge Kingdom. A group of four temples surround the lower part of the fortress walls, one fifth of which lie above the remains of the city, the former Summer Palace of the kings. Experience various landscape on the way to Shiquanhe (280 km), the capital of Ngari Prefecture in West Tibet a city at the confluence of Indus and Gar. Shiquanhe River the main source of the Indus, originates from the Kailash. Along on the Silk Road, the highest road in the world which leading from Tibet to Xinjiang. En route visit the remarkable pre-historic rock carving. Soon after pass by Mazar we begin to cross the Kunlun Mountains. The Chiragsaldi (4.960 m) is the last pass we have to cross on the way. Afterwards we drive downward along the Yecheng ravine to Xinjiang. Situated at the edge of the Taklamakan desert, Yecheng is a city with a pretty Bazaar inhabited by Uigur and Han Chinese. Early in the morning we drive about 250 km to Kashgar (1.300 m), the largest oasis of China. The tar road runs at the edge of the Taklamakan desert. On the way enjoy the landscape of the Kunlun.In the afternoon we visit the Sundays market of City Kashgar, one of the largest weekly markets of Asia. Situated at the foot of the impressive Pamir mountains, Kashgar was once the key trading post bridging the East and the West. Largely inhabited by the Uygurs, this ancient city is dotted with Muslin architecture and still retains the exotic feel of the Silk Road era. We will visit Kashgar's lively markets, which attract thousands of people from the far corners of the region. They come here to sell, bargain, and trade everything ranging from camels to raisins. Our sightseeing tour will also include the Id Kha Mosque and the tomb of Abjak Hoja. Our tour includes the tombs of Abakh Hoja, the famous Eidgah Mosque and the most unique old town with typical Uyghur styled homes. We visit the various shopping alleys full of noodle shops, bakeries, teashops, blacksmiths and carpenters. Time has stood still - try a local taxi, which is a donkey cart. Today we will have a free day, allowing you to explore Kashgar's old quarter, home to a fascinating mix of ethnicities - Uygurs, Tajiks, Kyrgyz and Uzbeks - or visit one of Kashgar's many other sights. In the evening we will take a flight back to Urumqi. Fly back to Beijing. Rest of the day free at leisure.